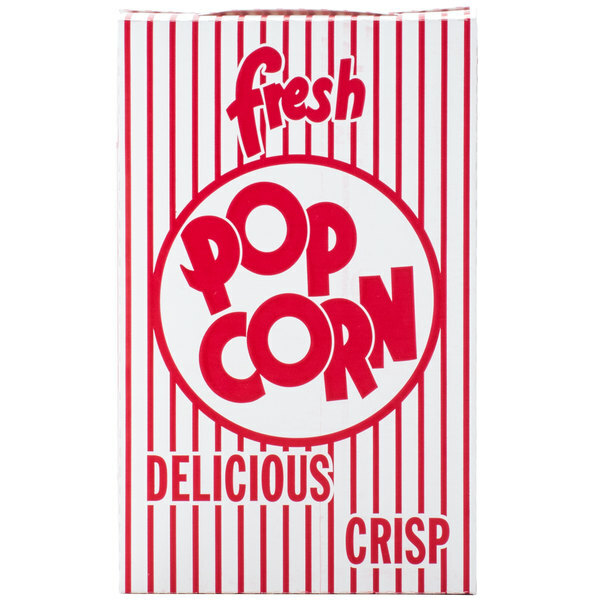 Serve your popcorn in style with this Great Western 11074 2.8 oz. popcorn box! This box features a classically playful red and white striped design, sure to appeal to your customers and increase impulse sales. 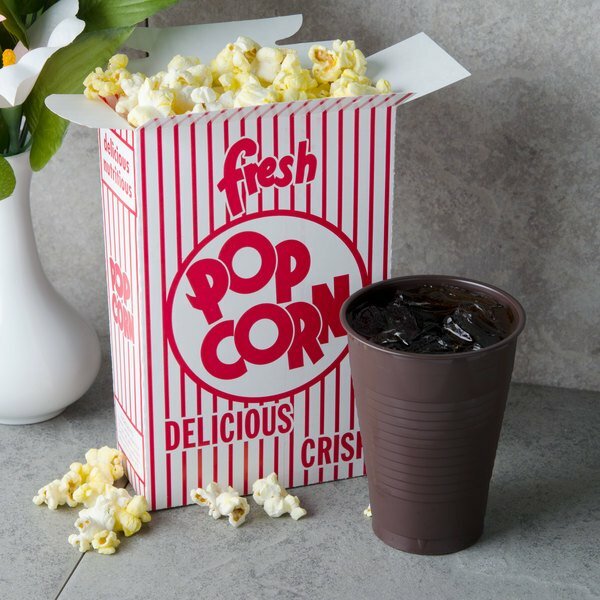 In addition, this box is resealable, keeping popcorn fresher for longer, and features a carry handle for taking your popcorn on-the-go. 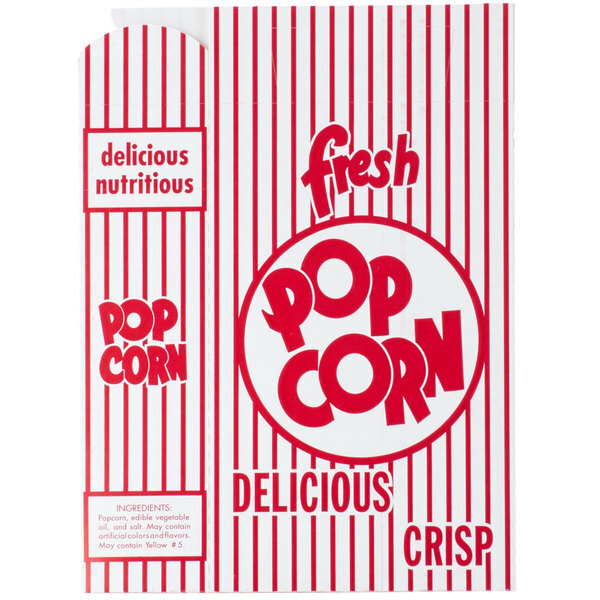 This 5 3/4" x 2 1/2" x 8 1/2" box is perfect for use in movie theaters, at carnivals, and anywhere crowds crave delicious popcorn. The boxes were right for carnival themed party. The box is large enough to share if completely filled with popcorn. Perfect size boxes and very sturdy. I did a carnival themed birthday party and these were perfect for the event. They hold a personal serving of popcorn and are easy to box up and close. Very cute ! 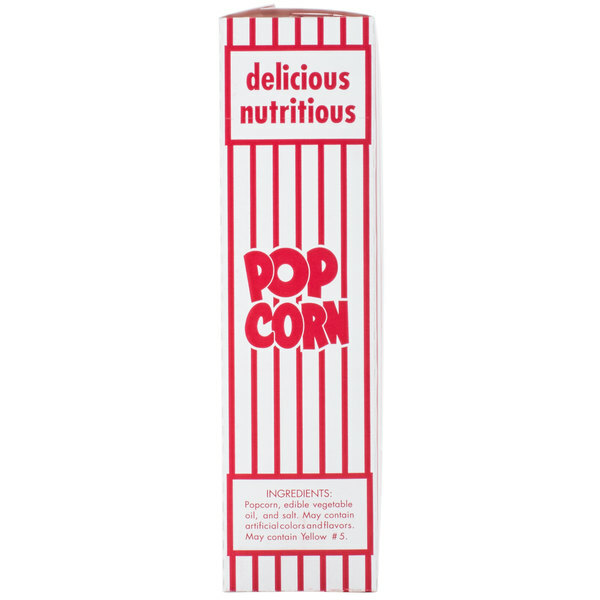 We used these boxes for large events and gatherings, as well as on a daily basis for popcorn purchases. The boxes are sturdy and hold a decent amount of popcorn. Easy to fold and we use the folded boxes as advertising in our concession area. Will continue to purchase in the future. These boxes are awesome. They look great and are the perfect size for a kid to eat popcorn for. Just fits the size of your hand. They are rugged too. The look is priceless! 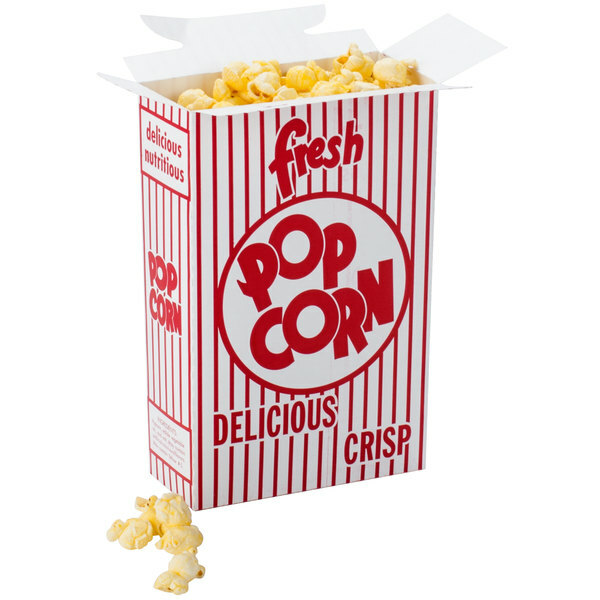 These popcorn boxes are very amazing! They were perfect for our weekly movie night. They are sturdy, and they contain just enough popcorn for our family. Boxes look great and easy to assemble. No issues with serving. I like this size and would not buy anything smaller. Tops and bottoms fit together nicely. Works great at any fair or festival, the design is bright and vibrant and they come looking for the popular snack they love. Can never have enough boxes on display. These popcorn boxes were great for our children's movie night. Easy to handle for the kids and less mess than the bags. Would Highly recommend this item.